Two PCF Bitmap Fonts, based on the original Terminus font. So far, only iso8859-1 (usually called western) is implemented, and only three rather small sizes (10, 11 and 12 pixel). Published under the Open Font License. I like this font. It's a cool mission. At first I figured this would be great for terminal use - improving readability while keeping a nice bitmap font, but really it's best suited for bars, panels and the like, where you don't care about font alignment but want it to fit in with your desktop. yes, the idea was to have the original (monospaced) terminus font (which is not by me) for terminals and this one for gui apps. i fixed some things, spacing mostly, and changed to pcf format. 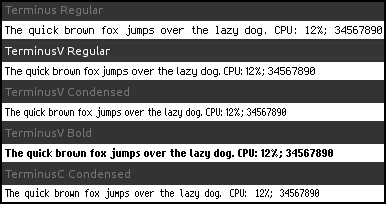 i also added a shorter version of all fonts - pxsz 9 in xfontsel - 6 or 7 for gtk apps. please check out the new version from the same link in post #1. I moved this to github. Because of larger screen resolution (and maybe poorer eyesight) I hardly use it anymore, but in a few circumstances it can still be useful.